The past few months we have been on a bit of hiatus due to school and some technical difficulties with our host. Now, we are back and better than ever. We are slowly evolving our webpage and always looking for improvement. Monday October 17, we shall see the official relaunch of OneTechTip (OTT) with daily posts and some new featured posts, still following our one post, one tip a day format. For example, we will be having an Andriod/iOS App of the week each week on Tuesdays. Subsequently, we shall be increasing our activity via social networks the next couple of weeks so be sure to follows on @OneTechTip and on Facebook. In addition we have an Android App which can be downloaded via the market, here. Here is 7 of my favorite featured tips on OTT in no specific order. Remote Access to Your PC From Anywhere - Teamviewer enables the user to take control of another computer, File Transfers, and access presentations. Great way to help a friend with a computer issue or see what they see. Look at the Alternatives - This posted highlights a site that features a list of Open Source Alternatives, free to use, to Premium Software. IM from your Browser - Increasingly social media networks are becoming an integral part of our lives, and many feature chats. In this post we show you a site that enables you to chat via multiple IM clients from one webpage. Apple Refresh - Apple has come a long way in a little over 10 years. Presently, Apple product redesigns and refreshes are quite common, in this post we feature a site that let's you know whether to hold of on purchasing the current iPhone or to go for it. Let's Make a Deal - Many of our non-tech savvy friends are unaware that often they save a significant amount of money by buying online. PCPartPicker - Ever wanted to build your own PC but did not know what components go with what? Feel Free to Contact Us about a tip or a tech related problem you face, whether you are tech savy or not. What is slowing down Firefox? Are you still even on Firefox? I moved a long time ago to Chrome as my main browser but I still use Mozilla Firefox because if its unique add-ons that are not for Chrome. Well, if your still on Firefox you can disable some add-ons to make your browser as fast as when you first downloaded it. Mozilla has released a list of the add-ons that have an impact on their browser. Below is the top 6. 1. )An introductory video on how to install and what features are available to recover your device. 2.) Prey's frequently asked questions. If you like the dock feature Mac OS X has, you might be interested in StarDock ObjectDock. They offer a "plus" version, but I think the free version is good enough. I used it for a while, it gets the job done nicely. On the other hand, I use Windows 7, and I found it to be overkill specially since Windows 7 allows you to pin icons, essentially, a static dock. I recommend it to anyone who does NOT have Windows 7 in their machine or does not like the pinned icons. Compared to the Mac OS X dock, it does NOT have stacks within the dock. A small set back, but not really essential to its overall functionality. Installation is simple. Simply download and install. It has relatively non-technical options to configure . The only option that is maybe a little tricky is the "optimize for performance or memory." Windows 7 and Vista need about 1GB RAM to start off, so if you have less than 2GB, I would recommend optimize for performance. Windows XP is less demanding, but if you have 512MB or less, definitely optimize for performance! Of course, you can always experiment with the setting! But if you need another reason to switch to Linux, there is a project called Cairo-Dock which, in my opinion runs circles around the Mac OS X. Above is a screenshot, but if someone wants more information on Cairo-Dock, please let me know! Get yourself the installation media, it is usually an ISO file which is a CD IMAGE. A couple of clicks, and you should be at an installation screen, all within a single window. Once installed, it will feel like you are running a system all within a window! The virtual machine software usually picks a safe amount of RAM for you, it should not need more than 512MB for Linux! Other that, there should be no problems! If you like this post, I will be more than happy to expand on it. In previous post, I briefly discussed Scratch as a great way to learn about programming concept and principles without learning the nitty gritty. If you are an educator or just a common user it's a great way to be introduce to some basic programming knowledge. If you delve into the Scratch website, you would notice that one of the companies contributing to the development of Scratch is Google!! Now if or when you are ready to make a jump from Scratch to something bigger, consider APP Inventor by Google. Inventor utilized the same interface as Scratch and would feel right at home. Inventor's purpose is to enable those with out the background knowledge to develop applications for the Android OS. Sure, I will admit that initially I figured that there would be influx of not so great Android Applications, but I could see how it could be used to introduce users to mobile application development. Fortunately you do no need an Android Powered phone to test any applications you make since Inventor enables you to download an emulator to use and test out your application. Subsequently, the Inventor has an online tutorial with a a step by step on how to make HelloPurr, which is equivalent to hello world program that many programmers are familiar with. HelloPur is a simple introductory app that enables you to create an Android application in which when you touch the picture of a cat on the phone and it purrrs. Application Inventor has a bit of a learning curve but you could make some complex applications with the right intiative. You will need a Gmail account to access Application inventor. One of the goals of OneTech Tip is to provide useful information and cool tech tips for non tech savy users. For those readers whom are not tech savy have you ever thought about writing your own program or even just something cool? Or if you are a tech savy user have you ever wish you could teach someone a peer, or a younger sibling how to program or introduce them to various programming concepts? MIT has created a programming language that is user friendly, Scratch. Scratch is a programming language that makes it easy to create your own interactive stories, animations, games, music, and art -- and share your creations on the web.T The language was mainly developed to encourage young kids and students to feel comfortable with programming through a drag and drop interface. Do not take this lightly, if you have never done any programming before you should try it out. Since the interface is mainly drag and drop you see the basic structure of how to write a program. On the official site there are highlights of some user generated projects. Here's a OneTechTip Challenge Create a game using the scratch programming language and we will highlight it here. Just send us an e-mail with your file. OneTech Tip has addressed alternatives to Windows and Mac OSX but what about the software. There are hundreds if not thousands of software that is free to use without a cost to the user. In some cases the open sourced software is sometime better, more efficient or meets your specific needs in comparison to larger, bloated commercial software. Open Source Alternative is a great place to start if your looking for some free and open sourced software ranging from office software to games as well. Now, the site I noticed does not have an exhaustive list but it does provide some good suggestions for alternative software. For example, you may search for an alternative to Photoshop and it will yield Gimp. If you are looking into becoming a more part of the open sourced movement consider this site to help you meet all your needs. Here's a challenge, try only using open source software for a week or a month. Ever needed toaccess your computer to do some work from afar? 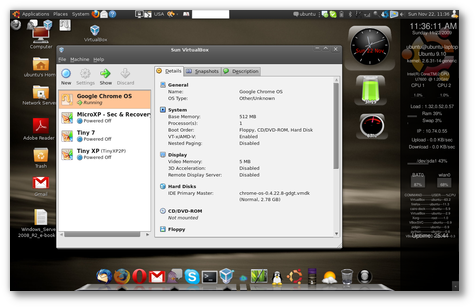 LogMeIn enables the user to access their computer from another computer with the remote access software LogMeIn. Why would you want to do this? Perhaps your on vacation and you need to access your computer for a business related emergency or you do not want to be carrying your notebook computer everywhere you go. Subsequently, there is a premium version that enables you to do more while accessing remotely. extends and revamps Windows Vista/Windows 7 BCD bootloader, and with EasyBCD, almost anything is possible. Setting up and configuring a dual-boot between Windows 7, Windows Vista, and older versions of Windows such as XP & 2003, Linux, Ubuntu, BSD, and Mac OS X are a breeze. You just point & click and EasyBCD does the rest. Repairs the Windows boot loader, change your boot drive, create a bootable USB, and more! Most users nowadays have two or more e-mails, how do they managed more than two. Typically by forwarding on e-mail to another e-mail address as a central hub of e-mails or using a e-mail client similar to Thunderbird or Microsoft Outlook. Subsequently, some users may have more than one screen name across different messenger programs. One way to manage being logged in to multiple screen names in different programs is to utilize a program that lets you chat on Facebook, AIM, Messenger, etc from one window instead of one for each. Meebo enables the user to login to multiple accounts at once. Although there is an option to download a Meebo application for your desktop. I highly recommend using their web services Meebo Messenger to chat from your browser. The reason being that you will be saving space on your hard drive as well as reducing your computer security risk. Each program your install could have an unknown security hole as well as over time an accumulation of programs may make your computer sluggish. In addition, you will reduce the number or likelihood of installing toolbars which is another security risk. Meebo is not the only program that allows you to chat from multiple accounts but the ability to use its services on web will add to convenience. [caption id="attachment_2368" align="aligncenter" width="300" caption="Video on Demand"] [/caption] To elaborate on an earlier post regarding hooking up your computer with the TV to watch several forms of media, there may be those whom do not always want to be connecting their computer to their TV to view media. There are solutions that offer several features that will convince you to ditch the discs (DVDs & Blu-Ray) , the satellite dish as well as cable TV (coaxial). First, I will mention new software that enables the user to instantly discover something to watch online from their couch via a set-top box. Whom is making this software? Google. Yes, this year Google has introduced Google TV which is software that runs specifically on a set-top box (think cable box) but the media is streamed and found online, minimizing the amount of commercials. Let's be honest here, you probably watch more commercials during an entire month than an actual show. Apple TV is another competitor looking to take a slice of the video on demand market with capabilities to rent and stream shows from iTunes. It will even allow you to use your iPhone or iPod Touch as a remote. But what if you already have content on a hard drive that you just want to view without turning on your computer. There are several media players out specifically for this such as the Western Digital Media Player, Seagate Freeagent Theater, ASUS O!Play, etc. The aforementioned are probably the top 3 media players on market. Depending on the model you purchase, you could view almost any media format available. In addition, they have HDMI and wireless capabilities. Subsequently, you could just connect your external Harddrive or a regular flash drive and they will automatically identify compatible file formats. At the moment I have not delve into a specific player but I am looking into investing in one. Fortunately, if you get tired of the content that you have, you may connect them to the Internet via an ethernet cable or Wi-Fi and access content from Youtube, Netflix or even Hulu. Although it depends on which respective model you purchase, some have a regular model that plays content from an external HDD while the premium model will enable you to access to online video channels. Why you should buy one other than the reasons above? The reason is saving money. In the longer term, you will be saving money from ditching services such as satellite TV and cable TV. Why pay for commercials when you could be paying for entertainment. Because of the growing content available online you may want to ditch the discs and the cable all together. Currently, this is where the market is heading; some have even said Blu-ray may be the last physical media format to be popular amongst consumers as more of them are seeking video on demand services. Unfortunately, I have barely touched the surface, I have not discussed the X-Box 360 and Playstation 3!! Apply to be a Test Pilot! Google is ending 2010 with a BANG!!! This past week Google made several announcements regarding their upcoming Chrome OS, Notebooks, and Android software. The most talked about of these announcements is perhaps the Chrome OS which is an OS that relies heavily on the "cloud" also know as the internet. Utilizing the cloud entails almost being connected all the time to the internet in some form and where information is automatically synced with an online storage space as well as saved locally on your computer. The Chrome OS is meant to be efficient and quick to boot up. In particular, the OS targets consumers who mainly spend the majority of their time online. All certified Chrome OS notebooks come with free 100mb of internet 3g via Verizon wireless each month for the first two years. The Chrome OS is not necessarily meant to completely replace your current laptop, at the moment, due to it being in development. Currently, they are still BETA testing the OS before a full retail launch in the Spring. Although, you could be part of this Beta testing by applying via Pilot Program in which you will get a FREE notebook with Chrome OS. Apply because you may never know if you wake up the next day with a new notebook. In my opinion, Windows 7 is one of the best operating systems to date, but it lacks some features I find handy when I use Linux. One of those features is the ability to have multiple desktops! VirtuaWin is the solution! You might wonder why is it useful? Having multiple desktops, in a way, compensates for the lack of a high resolution monitor and reduces clutter especially if you enjoy having multiple programs running with multiple windows. VirtuaWin is a light-weight application; it will run in the background without slowing down your system. To use, simply configure VirtuaWin to how many desktops you want, set a keyboard short-cut, set it to start-up automatically and you gain your way to perhaps a more productive working environment. Did I mention it’s free? As for recommended settings, I would stick to only two to three desktops. Too many desktops, and it will defeat the purpose of reducing the number of items a person has to manage! Also, enable the mouse to drag any window to a different desktop. Be warned, the Window 7 Snapping Window feature interferes with switching desktops via the mouse drag and will snap the window if it's Microsoft software; not a huge problem, but rather annoying. If you feel it's a problem, you can as well disable that feature within Windows 7. Enabling the mouse dragging emulates having multiple monitors. Finally, as for the desktop switching keyboard short-cut, I use alt + left/right arrow combination. Give it a try, especially if you do not have the cash to burn for a nice shiny 1080p monitor! Today's tip focuses on giving your computer more than one identity. Ever felt like being more than just Windows? You could be Penguin (Linux) and/or a Mac. How, you may ask? Partitioning. When your hard drive is divided into many different pieces or slices it is called partitions. These partitions are what one may call sub-hard drives in your main hard drive. In order to partition a hard drive you will need software to carry out the partitioning. Windows has a built-in program but I'm not a fan of it, so I will use the third-party software called EASEUS Partition Magic. NOTE: IT IS RECOMMENDED THAT YOU BACK UP ALL YOUR FILES BEFORE PROCEEDING. First, we shall resize the primary space where the OS is located (as highlighted above). Next, we determine the size of the partition you want to create which will use some of the space already set aside for the Windows OS for a new purpose. Once you have decided on the partition's size, click OK. A word of advice, the partition you are creating should at most be about the current free space available. If you go beyond, you may damage your system. You should see an additional unused partition which you may use to install another OS when prompted by the new OS. Are you an average computer user that is only aware of Windows and Mac OS's? If so, I have a revelation for you; these OS's are not the only operating systems available for your computer. For example, there is Linux. Yet with Linux, there are many different versions also know as distros. The most popular of the these distros, in my opinion, are Fedora and Ubunntu. Ubuntu is perhaps the most user friendly. On a quick note, I would like to mention that you can run Windows on a Mac and Mac OSX on a typically Window Machine with a bit of work. Subsequently, the main focus of today's tip is to allow the average user (or power user) to try out Linux. The objective is to run an entire OS from a flash drive (or a CD, if you still use those :) ). This Software automates the entire process for you. Once it is completed, you may now boot Linux from your Flash Drive. Change the boot order to "first be removable drive" or you may also see your flash drive listed there. Then once you exit, make sure the flash drive is plugged in. It should boot from your flash drive instead of your hardrive and voila! Linux has appeared. Once prompted, select Run and try it out! Now you may see what all the fuss is about. Tomorrow, I will show you how to use a software program to partition your drive so you may do a full installation without deleting your Windows. Want an Easy Online Photo Editor? Well Picnik, is a simple and free tool that is online and also available to anyone. You can edit and fix up any photo you want with just clicks. There are tons of special effects that you can choose from to make your pictures look the best. If you would like to upgrade to premium and get all the effects from Picnik, the price is only $24.95 a year. So come and check this photo editor out.
" I don't want to buy Photoshop", many have said. "It is too expensive and I only need it for simple things." Yes there are alternatives to Photoshop like GIMP and Paint.NET. They are good alternatives and will do the job but what if you need an alternative to Windows Media Player or just other software and maybe even find something for free. Well, a site called Alternativeto helps you find exactly what you need. It can help you find software for mobile phones and all major platforms. Just put and search the software and you will have the answer at your finger tips. 32-bit and 64-bit Windows: Which is better? Is 64 bit better because the number is bigger? A v6 engine is better than a v8 right? Not really. First, what does 32 or 64 bit mean? Well its how a computer's processor, handles information. If you have more than 3Gb of RAM you must get a 64bit CPU and OS. If you have less, a 32 or 64 bit system will do.The trouble at this current date is how still some programs are compatible. If you buy a new a computer it will usually have a 64 bit system. So when you go install a program make sure its the right version for your system. Still confused? leave us a comment ans we will answer your questions. Have you ever been tired of networks like Twitter or MySpace? Well, I have. This program, called Web 2.0 Suicide Machine, has the solution for you. Not only does this delete your profile, it also deletes everything that was in that network making it as if you never made an account. This service works on Facebook, MySpace, Twitter, and LinkedIn now. This program will soon have this suicide system for Flickr and Hyves. Come check this program here, if you are tired of all these networks.